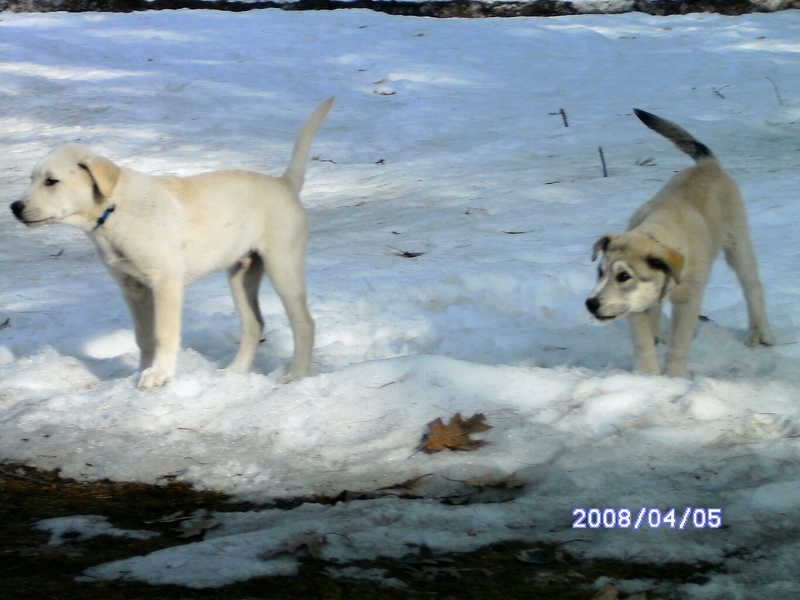 Looking back at my time with the litter of puppies, I have little regrets, but there is one thing that always lingers in my mind wondering if I should have done something differently. Part of the agreement of picking out a puppy was visiting at least a couple of times so that the new owners weren't a complete stranger to the puppies. Blaze was the first picked at about three weeks old. She met with her new owners several times as we would not let the puppies go to their new homes until they were about nine weeks old. Every meeting between Blaze and her new owners repeated the same cycle. Blaze kept running back to the whelping box during their visit. She didn't seem to have any interest in them. Feeling somewhat out of tune with why she was acting this way, I didn't know exactly what to do about it. I should have seen it as a sign of something. I thought maybe she just was too shy or would rather be with her brothers and sisters. Secretly I was smiling on the inside because I took it as she really didn't want to leave and even though she was quite the terror of the group, we were having a hard time with letting any of the puppies go. When the time came and Blaze was the first to leave the litter, I was relieved. 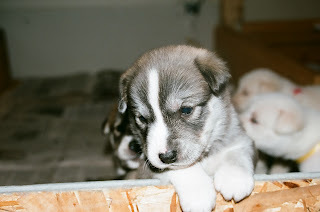 Ten puppies that were all teeth and running around the house, I was ready to say goodbye. If I knew then what I know now. We visited about once a month to see how Blaze was doing and get pictures of her growth. It didn't take long to know something was wrong. It was nothing we could ever prove, but something wasn't right. When we saw her at six months old she jumped into our car before we could even get out. It was obvious things for her were intensifying. A month later we got the call that they wanted to return her and we jumped at the chance to save her. The horrors she had lived through shown in her quiet demeanor. She was a shell of herself and haunted with every move. We were ever so grateful that they had returned her. It was the only good thing I think they ever did. We never knew the abuser of the family existed until after they took Blaze home. He never came to any of the visited and was never spoken of. It was he who made the call. A call we are forever blessed with as it could have ended so many different ways. I still wonder as I look back at those visits what would have happened if I had intervened and told the new owners I didn't think this puppy was for them . As difficult as these thoughts are, I also believe everything happens for a reason. Chance's new owners were related to Blaze's and they basically grew up together. If Blaze's owners hadn't of made that call to return her, then there was a chance that Chance's owners wouldn't have made the call to give him back either. I suspected that once Blaze came back, it was only a matter of time before Chance did and that's exactly how it happened. For the last three years I have struggled with the "what if" and the regret of not listening to those puppy instincts. 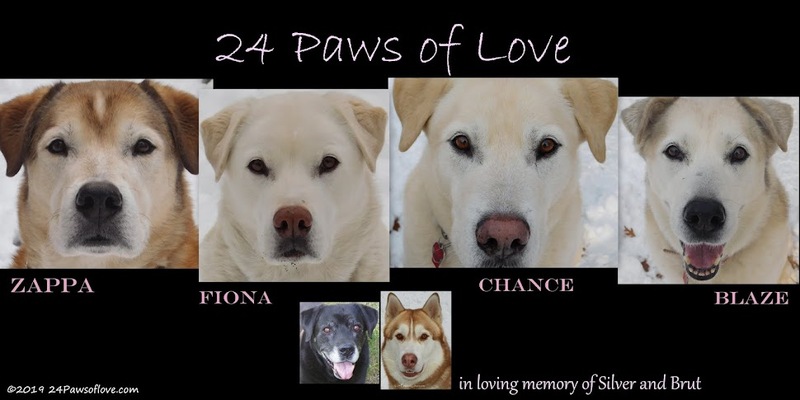 Today whatever the reasons are, I am glad they are both back, safe and sound and part of the 24 Paws of Love. For I have no doubts about that. Chance and Blaze home with us. I was riveted to your post this morning! Im sure the 'what if's' will always be there for you, but you did the best you could have done by inviting the new owners to socialize with the puppies before taking them home. Unfortunately it seems the family were obviously hiding something, or someone, from you and there is no way you could have known this. I am so pleased for you and in particular for Chance and Blaze, that there is a happy ending to this story. You just didn't know, plain and simple. Blaze is safe now, that's the only important thing!!! You showed the awesome responsibility of trying to find good homes for puppies in a very touching way. And although you can try to do everything right, you can't read minds or predict the future. The really wonderful thing you did that you should be patting yourself on the back for and jumping up and down about is that you created conditions that made Blaze's and Chance's new people give them back to you. Many people never want to face judgment and even a contract won't force someone to do something they don't want to do. You really did something right there! And of course, you will never know the answer. But the fact that they are both doing so well now should be enough for you to know that the right thing happened in the end. The pups are where they belong and all is well. Kudos to you for your puppy purchase plan and for following up on how they were doing. Aww Blaze baby! Bless her little heart! I will never understand how anyone can hurt one of God's creatures. I'm so glad they sent her back to y'all... so many dogs don't get that happy ending. Now she looks happy and healthy and gets lots of love :) Thanks for sharing this story! You did what any of us would of done, you gave people the benefit of the doubt! All that matters is that are back home, safe and loved! You kept in touch, you learned, now you must close the chapter and move onward. You must stop "beating up on yourself". Follow us...live in the moment. hindsight is always 20/20 and you had know way of knowing what would really happen. The main thing now is that they have a great home and are putting the past behind them one day at a time. Isn't it amazing how instinctive dogs are and it's so hard to know what they are saying to us? Your monthly visits were clearly life-savers for both Chance & Blaze. In hindsight we see things with a lot more clarity. It was a lesson learned for you, and if you become better for it, it's not wasted. At least you kept contact with them and eventually brought them back! I'm so glad they are back too, with loving parents who deserve them. But don't be too hard on yourself. It's quite human to not listen to intuition or be able to interpret things until later - the old 20/20 hindsight. Just be happy they are now safe, and where they belong. I'm glad to hear you have them back, and I bet they are glad to be home! it is hard to really know what goes on but THANK GOD they called you to return the pup. Intuition is powerful and I have learned from past experiences that I should always follow it. I am glad that the pups are living happily with you. I'm so sorry that Blaze had to go through what she did, and that Chance's family didn't want to keep him - but at least they were returned to you and can be part of a loving family instead of continuing to suffer. That is the beauty of hingsight, it reminds us to never forget to listen even when life makes such noise it's hard to do so. 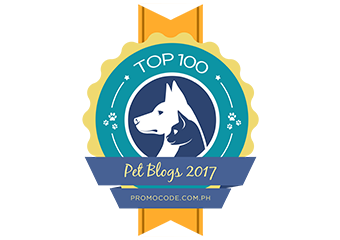 You are wonderful people and a blessing to those furangels, yes mistakes will happen, but it is what we do with the lessons they teach us, that matters in the end and from reading your blog, you are doing wonderful things with those lessons. Blessings and many hugs for your furbabies.